I remember when the original Spider-Man a decade ago when it came out in theaters. I was dazzled by the film, and when the sequel came out in 2004, I remember liking it even more. The series has always had a special place in my heart, and before The Dark Knight came out, Spider-Man 2 was my favorite superhero movie. But in 2007, the series was plagued by a lackluster threequel. It featured too many villains, gave Venom (my favorite Spidey villain in the comic books) too little screen time, and didn’t have the emotional impact that first two films did. But to be fair, the blame shouldn’t go to director Sam Raimi or Toby Maguire (who played Spider-Man). I’ve heard rumors that Columbia had the script rewritten from Raimi’s original version. And it wasn’t even the worse threequel of the year (that honor would go to the borefest Pirates of the Caribbean: At World’s End). So Columbia decided to reboot the series, which I think is a little unnecessary. They hired Marc Webb to direct, who made the fantastic (500) Days of Summer. They got Andrew Garfield, who starred in The Social Network, and Emma Stone, who was in Easy A and The Help, both big young stars. And not only that, but the movie also features some big names, like Martin Sheen, Sally Field, and Denis Leary. The movie revolves around Peter Parker (Garfield), a smart high school student who lives with his Uncle Ben (Sheen) and Aunt May (Field). Parker has a crush on a fellow student named Gwen Stacy (Stone), replacing Kirsten Dunst’s Mary Jane from the other Spider-Man films. Peter soon finds an old briefcase that belongs to his dad, including a picture that has him with a colleague named Dr. Curtis Connors (Rhys Ifans). Connors is missing an arm and is working to make a formula that will regrow body parts using lizard DNA. Fortunately for him, Peter gives him a valuable equation his father discovered that helps Connor complete his mixture, which causes him to become the Lizard, a giant mutated reptile who bears similarities to the Hulk and Godzilla. And at the same time, Parker is bit by a spider that gives him incredible strength, agility, and the ability to walk on walls. He develops a serum that shoots webs (more faithful to the comic books than the original), makes a costume, and becomes Spider-Man. But he realizes he has to use his powers for good once his uncle is killed by a crook. The first half of the film essentially feels like a remake of the original, which is the movies greatest flaw. It doesn’t really differentiate itself from it that much, just alters the story and the characters a little bit. And as good as an actor Garfield is, he doesn’t feel the same way Maguire did in the role. Maguire’s Peter Parker was a socially awkward nerd who the audience could sympathize with. But Garfield’s Peter isn’t really a nerd (though we’re assured that he is smart). His character is a loner, but a cool loner (he rides a skateboard, something which feels way out of place for his character). Not only that, but if you compare the characters from this film to the original, it pales in comparison. Emma Stone isn’t as strong as an actress as Kirsten Dunst and Sally Field feels awkward as Aunt May. The only repeated character that’s as on the same level as the original is Martin Sheen as Uncle Ben. And I couldn’t help but miss J. Jonah Jameson, the blowhard editor of The Daily Bugle, from the original, who supplied the comic relief. But the second half improves the movie vastly once the focus turns on the battle between Spider-Man and the Lizard. And I liked Denis Leary’s character, Captain Stacy, who’s the father of Gwen. And Ifans does a good job as Connors, evoking the same spirit William Dafoe did as the Green Goblin. 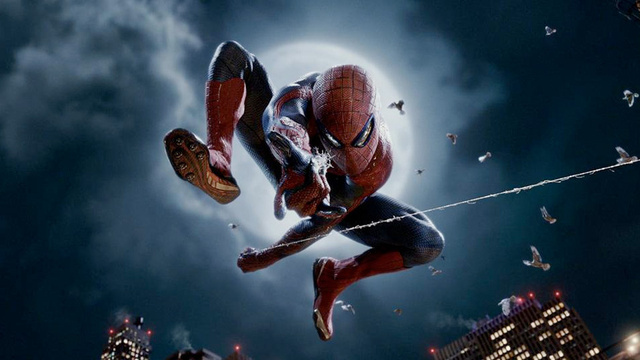 Is The Amazing Spider-Man better than the third film? That’s an obvious yes. But the film isn’t as strong as the first two films, which have more depth and emotion. I can recommend The Amazing Spider-Man to those who are deprived of superhero films. And I enjoyed many of the action scenes in the film. The other scenes, however, feel kind of blunt and awkward. If there is going to be a sequel, I’ll be willing to watch, due to my loyalty for the first two, but I’m hoping that it will improve off this one. For me TAS is my favourite Spider-man movie. I usually say that it is mostly a matter of taste. Some want the movies more “comic-book like”, but I prefer some good character development, and TAS has more of it than the original trilogy had in three movies. But like I said, matter of taste. But where I protest is concerning the female characters. Sorry, I really like Kirstin Dunst, but she has nothing to work with in this movie. Emma Stone and Sally Field on the other hand have substantial scenes and knock them out of the ballpark. Also, I have been a “nerd”, the looner, the outsider…and I always found the version of a nerd in the original version very insulting. It’s the Hollywood idea of a nerd. The TAS version felt way more real to me. The social awkwardness, the feeling of being invisible – and the skateboard was a very nice touch because it explains so well why he would feel comfortable to swing through the town like this.